ShoeMobile Servicing San Antonio, Houston, Austin, all of South Texas. We stock over 40 different styles of safety boots and shoes in the store. Obviously we can not stock all these boots in the truck. We have picked our best sellers to stock the truck. We will stock the truck with the type of boots that your employees require for the job. Our metatarsal footwear requests have grown considerably and we have put a trailer on the road to meet this demand. The trailer is fully stocked with metatarsal guard boots only. For accounts that have a need for both we can split the inventory on the truck. Our shoe mobile salesmen are well qualified in fitting your employees needs to ensure a great fit for comfort and long wear, also to assure the right boot for the right job. Currently servicing San Antonio, Houston, Austin and all of South Texas. The styles of safety shoes you have pre-selected will be available on the shoemobile to assure your employees receives the correct boot. Our mobile boot store will be there when you need us. We can be there anytime day or night, depending on your shifts. Over 800 pair of safety shoes/boots stocked on the truck, 400 mets on the trailer. Over 20 years with Shoe mobile service. Give us a call, ask for Ted or Robert and we will answer your questions. Our store hours are Monday thru Saturday 9:00AM to 6:00PM making it convenient for your employees to come and get a pair of safety or workboots charged to your account. Call us today to set up your company account. or fill out the form below and we will contact you. Thanks. 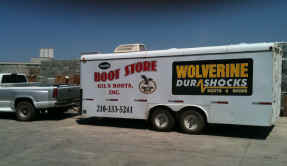 Shoe Mobile truck fully stocked with Wolverine, John Deere, Timberland Pro, Rocky, Carolina, Georgia, Justin, Double H, Skechers, Ariat, safety toe boots and shoes.